The house and the garage where Amazon was started are up for sale. This can be bought for a mere $1.49 million. For the first time in 10 years, the West Bellevue house where Jeff Bezos started the company in 1994 went up for sale Monday. The property consists of a garage attached to the three-bedroom, 1.75-bath craftsman on Northeast 28th Street was the original Amazon HQ. John L. Scott, which has the listing, is marketing the 1,540-square-foot house as “a slice of history” and a chance to own the “birthplace of Amazon.” The listing has been photoshopped with a picturesque sky, the photographer also digitally removed snow that was on top of the garage from the recent storms. The house was built in 1954, and it was extensively remodeled with a new roof and bathroom in 2001, years after Bezos moved out, and has a modern interior punctuated by a large, open “great room” (basically a connected living room/kitchen) that takes up much of the single-story residence, according to the listing. The listing agent, Pat Sullivan said, the garage also has been renovated and likely doesn’t resemble what it looked like when Bezos was there. Sullivan said, but the oversized mailbox that Bezos installed to receive lots of big catalogs is still there. However, the home will be out of reach for the vast majority of locals. As per typical home sales and mortgage qualifications, the house would require a down payment of about $300,000 and then an annual income of about $300,000 a year to afford the mortgage. If Bezos wants to keep the house himself, it would cost him only about 0.001 percent of his net worth. Amazon, like other giant companies with humble beginnings, has on occasion mentioned the garage origin story but has no official history about it on its website and declined to comment Monday. But “The Everything Store” book, which states the company’s history, says in reality Amazon was based there “for only a few months.” When it started hiring more people, Bezos moved the company to a small office in Sodo, and Jeff and (now soon-to-be former) wife MacKenzie moved from the house to a Belltown apartment. He is now the wealthiest person on earth with a net worth of $132 billion. However, he never owned the house. When he started the company, he was renting. But a lot of things have changed since then. 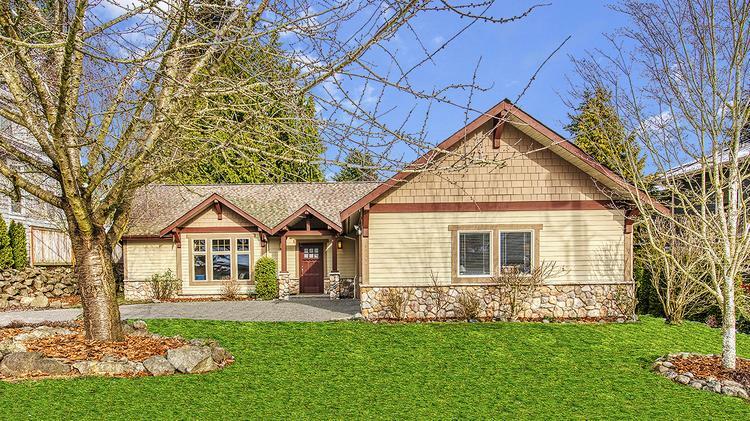 West Bellevue is now the most expensive neighborhood in the region to rent or buy a house. As per Zillow estimates, the house where Amazon was founded would rent now for $4,550 a month. The house’s price history can shed light on the degree of change in the price of homes in that area. The year he lived there, the county assessor valued the house at $135,000. After Bezos moved out, it was bought in 1998 for $182,000 — or $281,000 in today’s dollars. It was then sold again in 2009 for $620,000, or $720,000 in today’s dollars. And the current asking of that home is almost double at $1,488,888. Yet, it stays below the area’s median home price of about $2 million and is a bit less than the Zillow and Redfin estimates of the home’s value. Past Houses of famous people are not usually marketed as such. It is not even clear in the listing that it’s anything more than a regular old house. The last time the Amazon cradle house sold, in 2009, the buyer, a T-Mobile employee at the time, reportedly was not aware of any Bezos connection until a reporter told him. As per Sullivan, the couples who used to live there used to shrug off the home’s history as no big deal and only mentioned it in passing after they had come up with the marketing plan for the listing. As of now, Bezos owns a waterfront Medina estate valued at $76 million; also as per Wall Street Journal’s report, he also holds the $46 million property next door. Along with these, he owns a lot of properties all over the country, which includes Washington, D.C., Beverly Hills and Texas. Amazon now maintains its central nucleus of over 40 building in Seattle, but it has somewhat gone back to its roots by expanding recently into Bellevue, albeit in shiny new office towers this time.